–Atascadero City Council is reconsidering what they say was a rushed decision to ban the cultivation of medical marijuana within the city limits. AB21, a state Assembly bill that would remove a March 1 deadline for local governments to enact marijuana regulations,was signed by Gov. Jerry Brown on Feb. 3 after successfully passing the State Assembly in a 65-to-zero vote the previous Thursday. City Manager Rachelle Rickard presented four different options for the council to consider to address concerned raised by both members of the public and council members. Begin a public process immediately and move forward with an analysis irrespective of any potential ballot measures in November. Adopt an ordinance that allows personal cultivation at a level consistent with what is currently allowed by the Compassionate Use Act of 1996 as a place holder until it is known what might happen as a result of a potential November ballot measures. Leave the ordinance just adopted in place until after the potential November ballot issue is decided by the voters. At some point after the November election, council would evaluate the policy based on local desires and the legislation in place at the time. Repeal the cultivation ban and re-adopt the city’s previous medical marijuana ordinance. The council went with option four with some additional restrictions. The council gave direction to staff to take a draft ordinance that would look at allowing limited production within the city to the planning commission on March 1. The council directed that the ordinance should include the ban the cultivation of marijuana on vacant land, limit up to eight ounces of dried marijuana, 12 immature and six mature plants per person and not to exceed 15 immature and nine mature plants per dwelling, no cultivation in the yard as as defined by staff and the ordinance would only extend to individuals, not collectives. Several council members expressed concern going through with Option 1 because of the possibility of ballot measures going through in regards to adult marijuana use. While both Mayor Tom O’Malley and Mayor Pro Tem Heather Moreno said they preferred Option 4, or a hybrid with Option 2, Councilwoman Roberta Fonzi said she’s not comfortable going back to the old ordinance. For information on the upcoming Atascadero Planning Commission meeting on March 1, go to the city’s website. This story was originally published on Paso Robles Daily News and A-Town Daily News. My favorite part about living on the California Central Coast — besides the proximity to the ocean and the mild winters — is living in the heart of wine country. I barely new anything about wine until I moved here. I knew there were white, pink and red wines, my knowledge barely extended beyond that. After living in wine country — Paso Robles Wine Country specifically — I now know what varietals I prefer (for reds I like petite sirah, zinfandels and cabernets and for whites I prefer viogier and albariño) and what characteristics I like and what I don’t like (I don’t care for peppery wine, but would rather have a heavy, fruit-forward one). LXV Wine owner Neeta Mittal is really the heart and soul of the winery and tasting room. I first experienced LXV’s wine and along with its spice pairing three years ago when I went to First Saturdays in downtown Paso Robles (an art and wine event that included a few wineries and art galleries) with a friend. LXV was one of a few wineries on the tour, so we went in for a wine tasting and got the the spice pairing for a reduced price. I had never been to a place that paired spice with wine. Friend Stephanie and I tasting at LXV. That visit led me to pitch story about the winery’s wine and spice pairing to Edible SLO a year later. It wasn’t until a year after that that I was assigned to write the story. (Click here to go to the Holidays 2015 issue, the story begins on Page 24.) I had just arrived for an extended stay in Japan when I got the assignment, so I conducted the interview with Neeta via email and Skype. I’ve interviewed thousands of people over the last 20 years, and there are a few that stand out — in both good and not-so-good ways. Neeta is one of the good ones. A few months later I returned home from Japan and one of my first stops was at LXV. The day after Christmas with my parents and brother. It was the last stop after a day of wine tasting. After two other wineries, my parents were wined out, but came along for the ride. I had been hyping up LXV, and was prepared for my family not to feel the same (isn’t that what always happens when you tell people how wonderful something is and then when they experience it, it isn’t; or they don’t just find it as appealing?). But from from the moment we arrived, my mom was hooked. Even with my parents not tasting, Neeta and her staff made sure everyone was taken care of and brought them a plate of goodies to nibble on. My brother and I became wine club members that day. Because of the wine. Because of the Indian food lunches and dinners available only to club members. Because of Neeta. I could go on about the wine club and all the times I’ve been since joining the wine club less than two months ago, but I won’t. Instead I’ll tell you about the wine and food pairing I went to on Monday, which just happened to be my birthday. Neeta invited a few journalists for the special tasting, but said it didn’t matter if I wrote about it or not. She just wanted us to have a good time. And we did. I stayed after the tasting was over with a couple of other women just talking. The two hours before, Neeta treated us to five of the different wines LXV produced, along with cheese, meats and other food that will be on the tasting menu for Valentine’s Day — starting today through Monday. Neeta blended her Indian culture and the Kama Sutra for the Valentine’s tasting menu. Now, Neeta did temper that you won’t have a response from your libido if you’re not with the right person, so no worries about having a response to the food and wine. This was a fabulous food and wine pairing, particularly picked with lovers in mind. “The whole idea is to have fun,” Neeta said as we were going through the pairing. If you love food and wine, this something I recommend. There are always tons of choices for special events such as this. As a quite and reserved person, I like going places where the people are more outgoing. I want to chat with others and have a good time, I’m just not the most outgoing, so I need a little encouragement. For more information on upcoming events at LXV, click here. And if you ever want to go for a wine tasting at LXV, hit me up. I’ll take any excuse to go wine tasting. –After five years of writing, rewriting, editing and designing, Atascadero resident Lynn Higgins self-published “The Box,” which is a memoir about her Uncle Edward August Schultz. Higgins was 19 when her uncle lost his life in combat in Vietnam at the age of 21, just three months after he was deployed. “He never wanted to go to war, but he never complained,” Higgins said. Edward “Eddy” August Schultz graduated from San Luis Obispo High School in 1965. He died in Vietnam in 1968. Higgins started the book after her friend Jim Petersen told her he was traveling to Vietnam in 2009. She asked if he would stop by the village of Hoc Mon if he went by it. He did, and he stopped in the village. She said he came across some men who were Viet Cong members. That man then told Petersen to wait, and he took off on his bicycle and returned with a box; a gift for Higgins. Not long before Petersen’s trip, Schultz’s best friend and former platoon mate, Andy Wahrenbrock –a man he spent 24/7 with during the war– had contacted Higgins’ family. “I thought everyone in his platoon had died – that’s not the true story, but what I thought for years,” she said. Eddy Schultz service photo from 1968. He was drafted and sent to Vietnam. Three months into his deployment he was killed in action. Wahrenbrock, who now lives in Bakersfield, told them of the battle that took Schultz’s life, as well as the battles that preceded it. With his help, Higgins was able to write about Schultz’s life leading up to his death. Until Wahrenbrock visited Higgins’ family, they did not know that anyone from his platoon has survived. He was able to tell the family what happened in the war, and how Schultz died. Because Schultz and Wahrenbrock were together all day and night during the war, Higgins said she was able to get a pretty good picture of what her uncle experienced. She knew the age and where the man from the Viet Cong was from and used the history of people growing up there in her book. She told the story of both sides from when Schultz was a boy through his death. Schultz graduated from San Luis Obispo High School in 1965 and was drafted in 1968 when he was 21. Three months after he was deployed to Vietnam he was killed in action. Because Schultz was only two years older than Higgins, he was the last of six children in her mother’s family, they were very close. Higgins mom, Lorine, was the oldest and often took her mother and Schultz places around town. Higgins said Schultz was more like a brother to her than an uncle. The 182-page book was released on Jan. 9 via Amazon.com through its print-on-demand feature under the name Lynne Lorine Ludwick. The book is $10 and is printed and mailed once it is purchased. As of Jan. 15, Higgins said she had already sold 40 books. A friend of hers will be having a book signing and book launch party for her in the near future, most likely in March. She will announce the event on her website. Her sister, Judy McPhail, a speech therapist at Almond Acres Charter Academy in San Miguel, took the photo on the cover of the book and Higgins’ daughter, Lauren Christophel, who currently lives in Truckee, designed the cover. Higgins taught special education full-time for Atascadero Unified School District for 20 years, after subbing for 10 years. She has three children, Lindsey Lau, who graduated from Atascadero High School in 1998; Christophel, who graduated from AHS in 2001; and Michael Higgins, who graduated from AHS in 2003. Higgins was born and raised in San Luis Obispo. She graduated from SLO High School in 1967 and spent her eighth grade year in Atascadero. She is also starting a scholarship in honor of her uncle. For more information on it, click here. This was originally published on Paso Robles Daily News. –Owners of San Luis Obispo based Kreuzberg Coffee Company James Whitaker, Chris Tarcon and Alexander Ruckendorfer purchased Amsterdam Coffee House at 725 13th St. at the end of 2015 and took over ownership on Jan. 1. They have closed the coffee shop temporarily for a remodel and will re-open the locale as a branch of Kreuzberg later this week. The coffee shop closed Sunday at 3 p.m. and will reopen on Friday. On Saturday, Feb. 13 a grand opening celebration will be held with free drip coffee and cookies served. Whitaker said they planned the closure to impact business the least number days as possible. They will change the interior and at the same time bring over a number of menu items from their San Luis Obispo coffee house. The interior will more closely resemble the other coffee shop they own. The trio owns Kreuzberg Coffee Company, which roasts the coffee beans Amsterdam Coffee House had been using for the last year. The coffee company also sells its beans to coffee shops around the county. The three started the roastery, which is located inside Kreuzberg Coffee House in downtown San Luis Obispo, in 2014. Whitaker and Tarcon started the first coffee shop in 2010 as an experiment in a building that was slated to be torn down for the city’s Chinatown development. Whitaker said they took out a month-to-month lease to see what would happen, not expecting it to last this long. After 10 months on Monterey Street, they moved to their current location at 685 Higuera St., in a large store front that used to house a Chinese restaurant. The two were inspired by the time they spent in Germany in coffee shops. Whitaker lived in Germany for two years and Tarcon went to visit. The two spent their days, and nights, at coffee shops around Germany, especially in Kreuzberg, a neighborhood in Berlin. “You see incredibly hip concepts [there], you want to take these concepts to your hometown because they don’t have it,” Whitaker said. “They become cultural hubs,” Tarcon said. In Germany, both Tarcon and Whitaker were working as freelance web designers so would set up shop, so to speak, in a coffee shop eating breakfast and lunch there while enjoying coffee. “Sometimes we’d find ourselves at one cafe all day and all night,” Tarcon said. Whitaker added that the business models they saw in Germany were coffee shops that would become night clubs, or that would offer something else in the evening. After the started their first business in SLO, Whitaker and Tarcon then opened Batch, a small store front making custom ice cream sandwiches with fresh made cookies and ice cream, across from Big Sky Café at 1108 Broad St. A small Batch will be put into the Paso Robles coffee shop with window service at the door to the left of the main entrance. The owners said Batch won’t be open right away, but they hope to have it up and running by spring. The duo also owns Bowl’d, which make acai bowls and smoothies, at 1028 Chorro St.
With all of their businesses in downtown SLO, Whitaker said they’d been looking to open a second coffee shop somewhere else, so when the previous owners of Amsterdam approached them about buying the business, the timing was right. “We’ve been fans of Amsterdam,” Whitaker said, adding that the location in downtown Paso Robles is perfect. The coffee shop will be open daily from 7 a.m. to 6 p.m. Whitaker said it is a bit of change from previous hours when the business opened at 6 a.m.
“We may change it based on customer demands and events,” Whitaker said, adding that they want to have open mic nights and live music at sometime in the future. This story was originally published on Feb. 9, 2016, in Paso Robles Daily News. –Atascadero Unified School District is well into its moderninzation projects funded by a bond measure passed in November 2010. The district was authorized to issue and sell bonds up to $117 million. The total budget is $129,538,711 with a $5 million contingency. “The projects are going wonderfully well,” Atascadero Unified School District Director of Support Services Stu Stoddard said. The administration building at Atascadero Junior High School was demolished last year and in January a steel structure for the new building went up. “We’re looking at completion around the start of the 2016-17 school year [late summer-early fall],” Stoddard said. The new building will house administration, library and 21 classrooms. Two more buildings, which now house science classrooms and administration, will be torn down, and all portables will be removed. The modernization of the junior high will include accommodating bringing over a total of 10 sixth grade classes, an additional 300 students, from throughout the district. Currently, Stoddard said, there are already four sixth grade classes at the junior high school. At the completion of the projects, the school will be renamed Atascadero Middle School. In addition to the large project at the junior high, reconstruction is happening in four buildings at the high school in the 600, 900, 1100 and 1200 buildings. “We strip them down to bare bones and we put in all new finishes, including ceilings, floors, walls,” Stoddard said, adding that they will also get refurbishments of facilities and technology. This project is expected to be completed in August. The B Building, the original building, is expected to be torn down in March 2017, though Stoddard said that building cannot be torn down until new science classrooms are built. As the San Gabriel project wraps up, the project for Santa Margarita is slated to begin in the next three weeks. This story was originally posted on A-Town Daily News and Paso Robles Daily News. Lance Iunker is a veteran who served in Iraq for only a few months before he was severely injured. He returned home to San Luis Obispo after 10 months in a military hospital in Georgia. His battle with posttraumatic stress disorder eventually led to his current veterans project with the Institute for Advanced Technology and Public Policy at Cal Poly. The Institute’s Operation Headstrong project is led by Iunker, who began working for the Institute in early 2015, just months after he graduated from Cal Poly with a Bachelor of Arts in political science. Born and raised in San Luis Obispo, Iunker enlisted in the Army’s delayed entry program before he graduated from SLO High School in 2006. He immediately went to boot camp after graduation and was sent to Iraq with the United States Army Reconnaissance Surveillance Target Acquisition Unit in January 2007 as an airborne infantryman. He was seriously wounded in an incident on Sept. 10, 2007. An incident that left seven dead and 11, including Iunker, severely injured. He returned to SLO in July 2008 and married his wife, Laurie, in 2010. Laurie is a second-grade teacher at Guadalupe Elementary School. Around the same time, he joined Operation Open Home, a program started by Gov. Arnold Schwarzenegger’s administration, to bridge the gap between veterans and the services that help them. He was led to that program after he applied for the G.I. Bill and was denied because he was told he hadn’t completed his full term of service – he was wounded in an incident that occurred in combat, but was not considered a combat-related accident. Operation Welcome Home Project assisted him in filling out the needed paperwork. He was then asked by Schwarzenegger to give a speech on his experience in the military and in the project on the U.S.S. Midway in San Diego in June 2010. In his speech he told about the incident that wounded him – his unit had gone after 17 high-value targets and captured them. On the way back to base, the soldier driving the vehicle lost control, went through a guardrail and went off a 50-foot overpass. Iunker shattered three vertebrae in his back, some bones in his chest, had lung contusions, broken bones in his face and one ear was completely removed. A plastic surgeon visiting Baghdad was able to put his ear back together, Iunker said, and it took 70 staples to put his head back together. He started a student veteran organization on Cal Poly and spoke about veteran suicide and its prevention while he was at Cal Poly. He’s spoken many times over the year about his military service, how he was wounded and what happened after. “Though my physical wounds were healing, my psychological injuries were just starting. I spent years having nightmares, flashbacks, and battled insomnia,” Iunker said. After trying traditional methods of treatments, which he said often included pills of some sort, he found a neurofeedback therapy trial. He said some of the challenges veterans face are un- and underemployment, insomnia, flashbacks and nightmares, mental illness, alcohol and substance abuse, homelessness, increased divorce rates and dependence on prescription medication. “Every day 22 veterans die by suicide, which has led to 24 times as many deaths by suicide than combat deaths since 1999. It is obvious the current methods of treatment are not working,” Iunker said. So he’s taken what worked for him – neurofeedback therapy –and is working toward making that a reality for other veterans. First, he’s raising money to fund a local case study for 20 to 30 veterans who have PTSD. If that is successful, a larger scale case will be conducted for veterans around the country. Eventually, he’d like to make the neurofeedback devices available to all veterans who suffer from PTSD. Operation Headstrong partnered with SenseLabs in Atascadero because it developed a new mobile device. When Iunker underwent the neurofeedback therapy, he drove over the Grade from SLO to Templeton four times a week to get the training sessions. The device is basically a headset that pairs with an Apple device. The headset assesses the veteran’s neurologic status and then gives him or her a protocol for training. Then the patient spends 20 minutes retraining his or her brain with a digital game that rewards the brain for producing lower brain waves. Iunker said that it took him a lot training sessions. “[I] didn’t notice a lot of improvement until 40 or 50 sessions.” He had been having a lot of flashbacks – seeing, feeling, hearing and smelling and explosion while doing day-to-day activities. “[The neurofeedback therapy] really helped ease those,” he said. The therapy helps get the brain back into a meditative state, Iunker said. It is recommended that the training sessions be done at least three times a week up to six times a week. Right now Iunker is working to raise $30,000 to fund the local case study. He said at least a quarter of the funds have been raised so far. Once the project has the money, the case study will begin. For more information on the project or to donate, go to www.operationheadstrong.com. During one the speeches he gave, Paso Robles resident Dale Zeulner heard Iunker speak at Band of Brothers at First Baptist Church in Paso Robles. During that speech, Iunker said that since the Army considered it a “non-combat-related” accident, none of the soldiers involved in it received Purple Hearts. Zeulner was given a Purple Heart by a wife of a man who earned it. Since that time, Zeulner said he was looking for a soldier who deserved it. When he heard Iunker speak, he knew he was the one to get the Purple Heart. On Veterans Day, Iunker spoke and then was presented the Purple Heart by Zeulner, who is now 91 years of age. This story was originally published the February 2016 issue of SLO Journal. –Citizens in the vicinity of the Printery building in Atascadero, shared concern on Facebook Sunday afternoon after seeing smoke coming from the abandoned historic building. Atascadero City Fire Department personnel responded to the call just after 2 p.m. and found Phillip Martinez, 39, asleep or passed out next to a fire that was six feet by six feet in a room at the back of the Printery along West Mall, Atascadero Police Department Robert Mollé said. He said it is believed that Martinez is homeless or a transient and somehow got through the fence around the Printery and into the building through one of the many broken windows and started the fire to stay warm. It rained off and on Sunday. Mollé said Martinez was not injured and was transported to San Luis Obispo County Jail on suspicion of reckless fire and lodging without permission. No further information is available at this time. The Printery building’s fate is currently uncertain as it is still under the ownership of Kelly Gearhart who is serving 14 years in prison after pleading guilty to wire fraud and money laundering. However, local residents have formed a nonprofit group, Atascadero Printery Foundation, to save the Printery. This story was originally published on A-Town Daily News and Paso Robles Daily News. Bret Landen before Judge Jackie Duffy on Jan. 25, 2016. Photo by Heather Young. –Bret Landen, an 18-year-old who will stand trial for charges of making threats against San Gabriel Elementary School on Sept. 11 of 2015, went before San Luis Obispo County Superior Court Judge Jackie Duffy Monday morning for further arraignment. Landen addressed the judge along with his attorney, Jeffrey Stein. Stein requested that the arraignment be continued until March to give the attorney, who’s newly representing Landen, time to look at a way to address the case. Opposing counsel agreed to the continuance and Duffy continued the arraignment until Tuesday, March 8. Landen posted a $500,000 bail at the end of 2015, and will remain out of custody for the time being. Bret Stephen Landen. Photo from Youtube/KSBY. –San Luis Obispo County Deputy District Attorney Lee Cunningham released the name of a teen being charged with making threats against San Gabriel Elementary School on Sept. 11 that forced the school to close for two weeks. On Tuesday, Cunningham reports that Judge Jackie Duffy ruled that the suspect, 18-year-old Bret Stephen Landen, be tried as an adult. Landen was 17-years-old at the time of the alleged crimes. Landen, appeared to have been conducting a sort of, “game” with the teachers, much like the movie “Saw.” Police said the suspect’s actions appear to have been designed to evoke fear and panic. There were initially two charges being pressed against the suspect, both related to threatening to use a weapon of mass destruction. He is now facing as many as 25 counts. The suspect appeared to have been conducting a sort of, “game” with the teachers, much like the movie Saw, and the suspects actions appear to have been designed to evoke fear and panic, according to Atascadero Police Chief Jerel Haley. 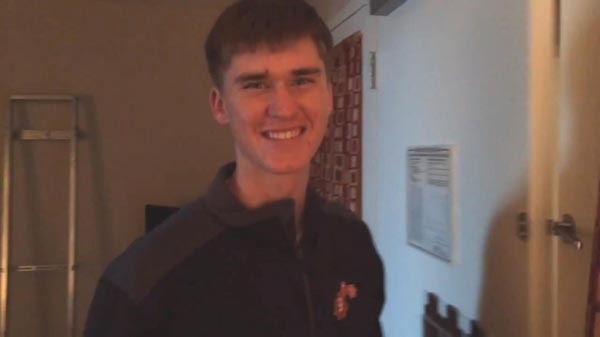 The case against Landen went before juvenile court Tuesday for a “fitness hearing” to determine if he is fit to be tried in juvenile court or adult court. “The case started out in juvenile court, because the person charged with it was just shy of his 18th birthday,” Cunningham said. Cunningham said that it is anticipated that felony charges against Landen are expected to be filed on Wednesday and include 25 counts of criminal threats, two counts of threat to use a weapon of mass destruction, two counts of attempted criminal threats, and two counts of second-degree burglary. Brooks is set for arraignment in SLO Superior Court in Department 4 with Duffy on Friday, Dec. 18. His bail has been set at $500,000 and he is currently in juvenile hall custody. Atascadero Unified School District Superintendent Tom Butler, Chief investigator for the District attorney’s office Bill Hanley, Atascadero Chief of Police Jerel Haley, District Attorney Dan Dow and FBI Agent Brian Sullivan. At approximately 7:45 a.m. on Sept. 11, police received a report of a crime committed at San Gabriel Elementary. Between the evening of Sept. 10 and the morning of Sept. 11, chains and padlocks were placed on the exterior gates of the campus, threatening letters were placed outside of each classroom and a suspicious object full of liquid was found on the playground. The object was a candle jar with the wax removed and a different liquid put in, and was zip-tied to a fence. The accompanying note identified the liquid as “cyanide.” After testing, the liquid was found to be sodium ferrocyanide, a common chemical used in photo processing, mixed with a mildly acidic liquid that was not strong enough to emit cyanide gas; it would only be harmful if ingested, police said. The school was closed immediately and classes relocated to other campuses in Atascadero for two weeks. According to Police Chief Jerel Haley at a press conference in October, Landen was believed to have acted alone. 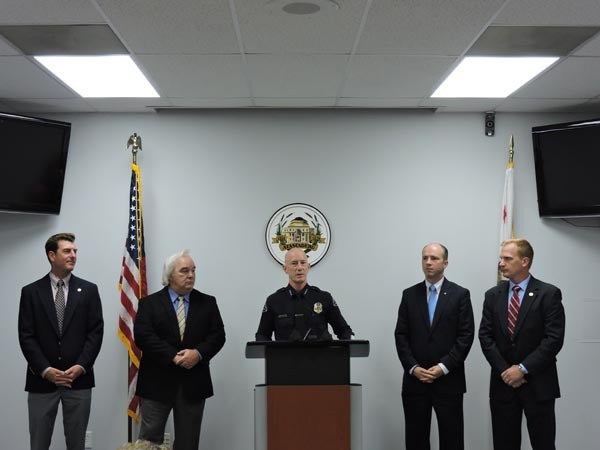 – A press conference was held today in Atascadero regarding the arrest of a 17-year-old local high school student who is a suspect in the investigation surrounding the San Gabriel School incident that happened on Sept. 11. Threats and objects found on the playground forced the school to close for over a week. According to Police Chief Jerel Haley, the suspect was believed to have acted alone. He is currently in custody and is being detained at the County’s Juvenile Detention Facility. 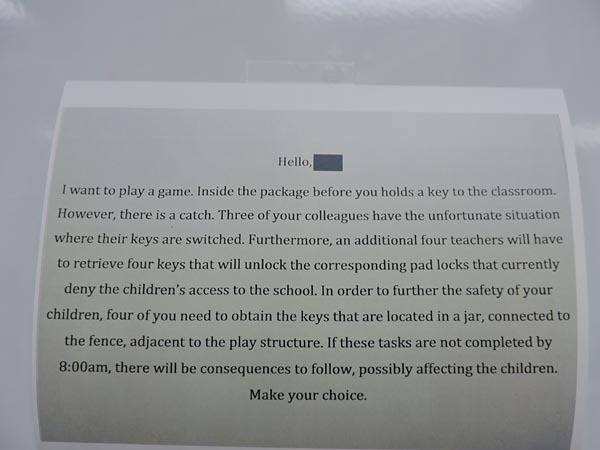 More details were released regarding the incident, such as the contents of the letters that were placed at the doorways of each teacher’s classrooms, pictured below. The suspect appeared to have been conducting a sort of, “game” with the teachers, much like the movie Saw, and the suspects actions appear to have been designed to evoke fear and panic, according to Haley. The contents of the suspicious object found on the playground were also described in more detail. 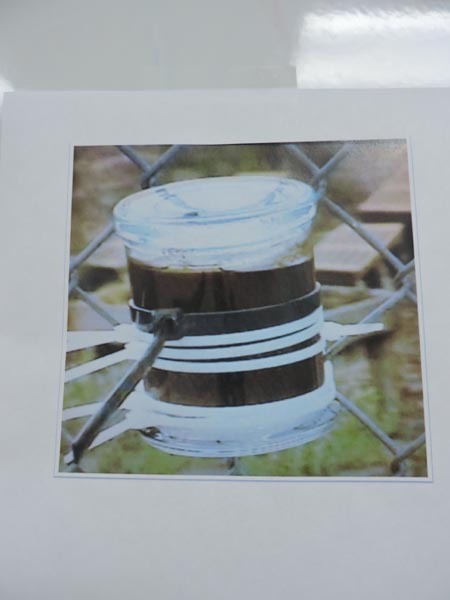 The object was a candle jar, with the wax removed and a different liquid put in, and it was zip-tied to a fence. There was a note found nearby by the suspect identifying the liquid as “cyanide.” The liquid put it was found to be sodium ferrocyanide, a common chemical used in photo processing, mixed with a mildly acidic liquid that was not strong enough to emit cyanide gas, and would only be harmful if ingested. It is unclear now as to whether the suspect will be tried as an adult of as a juvenile. The search warrants issued proved to be successful, and the investigation is still ongoing. Officers found items that connected the suspect to the crime in the search. The investigation was able to nail down a suspect by tracking purchase histories of items used to commit the crime. The suspicious object found on the playground. There are currently two charges being pressed against the suspect. Both charges are related to use of a “facsimile” or replica, weapon of mass destruction. Haley reiterated the fact that no additional hazardous materials were found on the campus, and at no time was there believed to be a bomb on the school campus. Haley said that even with 25 plus years on the force, “this is the most complex case I’ve seen.” He said that he was very proud of all of the officers who worked on the case in a timely and efficient manner, and praised the school and all involved for their swift and effective response to the evacuation of the school. Original story posted Oct. 14, 12:30 p.m.
– Earlier today, the Atascadero Police Department, Federal Bureau of Investigations, San Luis Obispo County District Attorney’s Office and San Luis Obispo Sheriff’s Department participated jointly in the service of search warrants related to the Sept. 11 incident at San Gabriel School in Atascadero, according to a report from the school. This has been an active ongoing investigation since the incident was first discovered. The investigation has been a joint effort between the Atascadero Police Department, FBI and SLO County District Attorney’s Investigators. During the course of the investigation a juvenile suspect was identified. Evidence uncovered as part of this investigation corroborated the involvement of the juvenile suspect in the commission of the crime. The juvenile suspect was contacted and interviewed on this date prior to the service of the search warrants. On the morning of Sept. 11 at approximately 7:45 a.m., police received a report of a crime committed at San Gabriel Elementary. It appears that on the night of Sept. 10 or the early morning of Sept. 11 there were chains and padlocks placed on the exterior gates of the campus by an unknown suspect, as well as threatening letters placed outside of each classroom. A suspicious object full of liquid was also found on the playground. The Atascadero Police Department, Federal Bureau of Investigations and San Luis Obispo County District Attorney’s Office will hold a press briefing today at 3 p.m. at the Atascadero Police Department, located at 5505 El Camino Real, to answer questions related to the investigation and provide further details about this case. Updates will be posted. –Savor the Central Coast will go on the road with Visit San Luis Obispo County this year, the organization’s president and CEO, Chuck Davison said, to food and wine events around California and to target areas, such as Las Vegas. The Visit SLO County Board of Directors took that action in the same motion as it decided to temporarily put the event on hold Tuesday morning. The proposal before the board on Tuesday was recommended by the Visit SLO County marketing committee. Davison said there could be a Savor event this year somewhere. The local tourism organization owns the Savor brand and while it considered selling the brand, the board decided to retain ownership to keep control of the event. The event took place at the Santa Margarita Ranch and cities around the county for six years, Davison said that 43 percent of the attendees to the 2015 event were from outside of SLO County. “That was the highest number for the history of the event,” Davison said. Davison said Rob Rossi, one of the Santa Margarita Ranch owners, was at Tuesday’s meeting, offering his support of the event. Updates on Savor events will be on the Savor the Central Coast website, and updates on Savor going on the road will be on its social networking sites: Facebook, Twitter, Pinterest and Instagram. The board oversees the county’s tourism marketing district, which meets the third Tuesday of the month at different locations around the county. This month’s meeting was held at Allegretto Vineyard Resort in Paso Robles. This was originally posted on Paso Robles Daily News. –In a special meeting called for the Atascadero City Council on Tuesday at 5 p.m., the elected body passed an ordinance that would ban the cultivation of marijuana for any reason in the city of Atascadero. The ordinance would go in effect as of Feb. 25 if the council passes the second reading of the ordinance at its meeting on Jan. 26 at 6 p.m., which is 30 days later. There is tight timeframe, Community Development Director Phil Dunsmore said, because the state adopted the Medical Marijuana Regulation and Safety Act that goes into effect on March 1. The bills, AB 266, AB 243 and SB 643, were passed in October 2015 and will govern cultivating, processing, transporting, testing and distributing medical marijuana to qualified patients. It also allows city and county governments the opportunity to adopt local ordinances by March 1. Local municipalities that do not have regulations in place will have to then comply with state mandates for regulation. All of the speakers during public comment expressed concerns with extending a blanket ban over cultivation and deliveries. Two speakers suggested grandfathering in or considering pre-existing conditions for those who are already cultivating cannabis plants as allowed by law. While all five of the city council members expressed sympathy and concern for those affected, they agreed that passing the ordinance as presented by staff was the best alternative for the time being. Earlier in the month, Paso Robles City Council took on the same issue and voted to prohibit the cultivation of medical marijuana within the city. Though Paso Robles City Councilman Fred Strong requested that the issue return to the council in the future. To read the full text of the staff report and ordinance, click here. This story was originally published on A-Town Daily News.